If you are looking for Exam date of Uttarakhand Sahayak Samiksha Adhikari 2016Exam or UK Assistant Review officer . 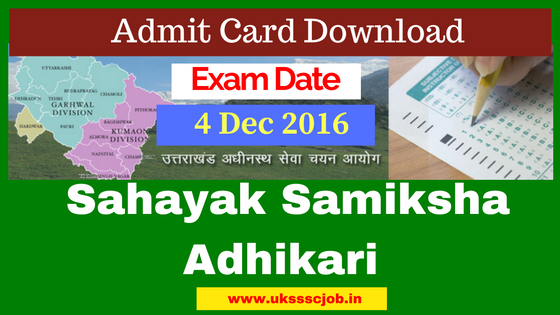 Today UTTARAKHAND SUBORDINATE SERVICE SELECTION COMMISSION (UKSSSC) has released the Admit card of ARO Assistant Review officer/ Sahayak Samiksha Adhikari 2016. Candidate who applied for the post can Download their Admit card. ARO syllabus, exam pattern, exam date, admit card, answer key, result. OTHER IMPORTANT INSTRUCTIONS BEFORE ENTERING THE EXAM HALL. Identity proof. Please note that without Identity proof they will not allow you to sit in the examination. so keep your id proof along with your Admit card.